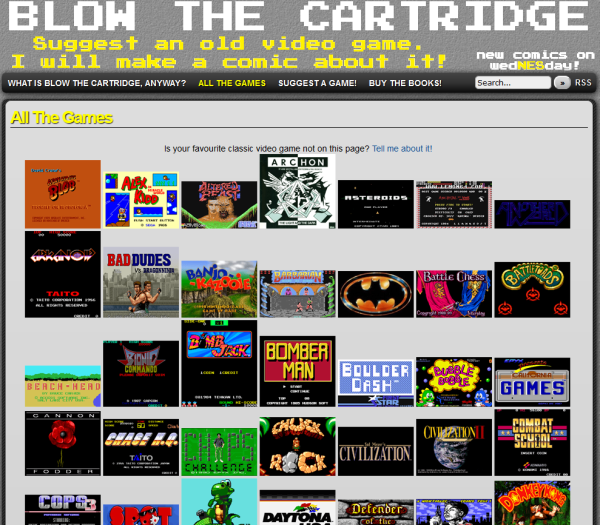 Just found out about an awesome website called Blow the Cartridge. It contains a ton of retro gaming comics, inspired by your old favourite (or possible non favourite) games. You can even request the author to draw a comic for the game of your choice. You’ll find comics inspired by games such as Double Dragon, Giana Sisters, Way of the Exploding Fist and Superfrog. Have a good weekend (or what’s left of it that is.. ;))! I’ve took a look at few. Some are rather loosely related to games they refer to but in general this is funny stuff. Brilliant idea. Thanks for sharing! Yeah, indeed. Blood, killing and gore 🙂 PEGI is a joke. Fantastic site mate, thanks for sharing. Had a right old chuckle at some of these. Thanks for commenting. 🙂 Glad to hear you enjoyed it! It’s a nice site, very worthy a visit. I’m going to suggest a game, but I’m unsure which one yet. I will definitely have to check that out later. Hi mate! Sounds good. 🙂 Please let me know if you liked it. Good luck with school btw! Thank you, I don’t start until the 23 for school. Checked out the site, some of the comics are pretty damn funny, especially for some of the games were kind of lame. Haha! That is an easy one; Eternal Champions. Hard to play, tried hard to rip-off Street Fighter and Moral Kombat, and had the most clunkiest gameplay. It was like the steroid version of both games, but too full of itself to care what anyone thought of it. The site is amazing! I have heard of SO FEW of those games, but I just love retro. It’s precious! I saw the ‘Dr Mario’ one, & can only imagine that one would be funny :). How clever, making a comic about a game you nominate. That’s just amazing creativity. Thanks for commenting! 🙂 Much appreciated! All this old games is my favorite especially Batman, Contra, and Double Dragon. Oh wow, I just discovered this page! Thank you so much for linking to my comic and everyone for their comments. You are very kind! And please keep the suggestions for games coming, I love hearing them! I really like your page. It is a good one. 🙂 Sometimes I pop by for a retro-game orientated laugh. 😉 I will think of more games for sure! Definitely, this blog is full of good posts. I am loving, going through all of them.